Customer payment delays can be an issue to any business, but those in the construction sector often have to offer customers credit terms and can additionally experience extended periods of delay before getting paid. Research suggests that the average time subcontractors have to wait for payment has risen to 44 days. You can use Construction Invoice Finance to bridge that cash flow gap. 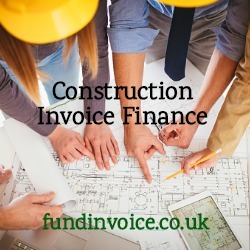 The service called "construction invoice finance" if a form of funding for companies that bridges the gap between raising your invoices (or producing applications for payment) and receiving the cash from your debtor. You receive prepayments against your sales, typically about 70% of their value, with the balance paid to you (less the fee for using the finance) when your customer pays. This avoids the need for you to wait around for payment and you can use these funds for any purpose. Also, you don't have to commit to an ongoing funding arrangement. There are selective facilities that allow you to pick and choose which transactions to have funded. Alternatively, if you want to maximise your funding (and get a bulk discount on the cost), you can raise this type of finance against your whole sales ledger of outstanding sales. If you had say £100,000 of outstanding sales, you could raise up to £70,000 at once. It doesn't matter if you don't raise sales invoices, it is very common to raise "applications for payment" in the construction sector. Whilst many invoice finance companies will not accept these, we have a number of providers on our panel that will. They will fund against them in the same was as described above, even if they are uncertified. For more information about how construction finance works, who is eligible and how the costs work, please see our product page: Construction Sector Finance.